Maybe, just maybe, the U.S. government found its compassionate side and decided to think about our on-flight sanity before enforcing a sweeping laptop ban on incoming flights from other countries. According to reports, the U.S. could back off if international airports beef up security screening. Talks of electronics bans on incoming flights into the U.S. have been going on for several months now, sparked by concerns over terrorist groups working on hiding bombs in portable devices. The 71 airports targeted by the ban are in Europe, Africa and the Middle East, according to Bloomberg. 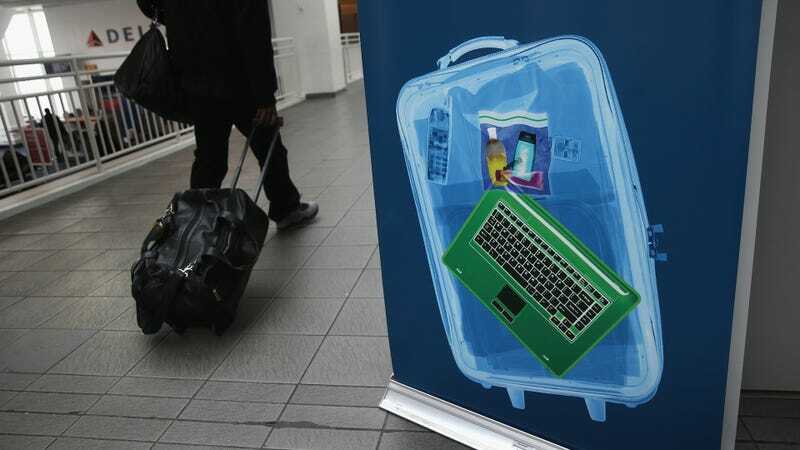 Laptops and electronics would still be allowed in checked bags, which presents its own problems. Bombs can explode there, too, and passengers would be left to sit in terminals and on long international flights without the ability to be productive on computers. That’s kind of how people get things done these days. The ban is still under consideration by the Department of Homeland Security, but Bloomberg reports that U.S. officials plan to meet with representatives from other countries in Malta to discuss amping up security measures. Bloomberg reports that the exact measures are classified, but that the focus is on obtaining more passenger data and screening electronic devices more thoroughly. An official from the European airline industry told Reuters that some measures have already been suggested by the U.S., such as “explosive trace detection screening, increased vetting of airports’ staff and additional detection dogs.” Reuters also reports that a ban expansion could affect multiple U.S. carriers. Today, the Commissioner for Migration, Home Affairs and Citizenship Dimitris Avramopoulos and the Commissioner for Transport Violeta Bulc had a positive and constructive phone conversation with U.S. Secretary for Homeland Security John Kelly. Both sides agreed to intensify talks both at technical and political level to find common solutions to mitigate potential threats to aviation security and work together to step up security requirements. No conclusion was reached today and no new announcement was made. Discussions are ongoing in view of raising the bar for aviation security globally. The EU and U.S. will continue working together to secure EU and U.S. citizens’ safety and global aviation security and to maintain clear lines of communication and strong cooperation going forward. The string of bans started in March with a barring of carry-on electronics on flights to the U.S. from 10 airports in Muslim-majority countries in the Middle East and North Africa, which came straight from the Trump administration. The concern among U.S. officials, as mentioned earlier, stemmed from intelligence information suggesting that terrorist groups are working to conceal bombs in portable electronic devices. The ban never really made sense, but shocker: A couple of months later, news came out that the White House was considering banning carry-on laptops on all international flights into America. These days, the U.S. is focused on these 71 additional airports. What’s almost laughable (but actually terrifying) is that the U.S. government is on its high horse about security screening, but America’s TSA screening agency is notoriously bad at detecting things and its screening procedures are terrible and selective anyway. The TSA had a 95-percent failure rate at detecting weapons just two years ago, and new, stricter regulations the TSA is testing out would only apply to regular passengers—not those who simply pay for TSA Pre-Check. So, you can pay to avoid heavier screening in the U.S. so long as you pass the application process. And here Homeland Security is, worried about laptops from other countries.